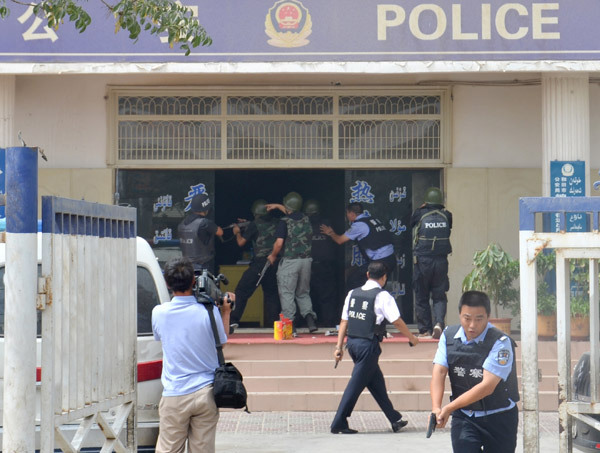 Urumqi - Police killed 14 rioters and captured four others who had attacked a police station in Hotan, a city in Northwest China's Xinjiang Uygur autonomous region, at noon on Monday, local government officials said on Wednesday. Hou Hanmin, chief of the autonomous region's information office, told China Daily the incident was "a severe terrorist attack". "It was obviously a long-planned, unprovoked, terrorist attack, aimed at the police station," Hou said. "To attract the attention of police inside the station, the rioters first attacked two passers-by not far from the Naarburg Street police station (where the riot happened on Monday)." Eighteen rioters slipped into the city on Saturday and bought or made the knives, explosives and other weapons they would later use in the attack, according to the results of the local government's initial investigation. Police shot down the rioters within 90 minutes of the start of the attack and then managed to free six civilians who had been taken hostage in the station. The casualties were not all on one side. An officer with the local Armed Police brigade and a public security worker lost their lives rescuing the hostages. And two hostages were killed by rioters during the rescue operation. "Four people were injured, including a police officer and a public security worker," Hou said. They are now in the hospital, "and have no life-threatening injuries," Zhao Genlin, a policeman at the Hotan police bureau, told China Daily. "The rioters were bloodthirsty," Hou said. "One of the injured people was stabbed by a knife. The rioters pierced the knife through the man's neck." Among the rioters' victims was Memet Eli, a public security worker who was a Uygur native. The assailants hacked him to death while they were trying to break into the station shortly after 12 pm Monday, Ablet Metniyaz, chief of the Naarburg Street police station, told Xinhua News Agency. "He was just 25," said Abliz, an officer at the station. "He had planned to get married in September." During the attack, the rioters took six civilians and a group of police officers hostage. They also smashed and set fire to many things in the police station, leaving behind computers, printers and furniture pieces that were damaged and clothes that were scattered, Metniyaz said. Shouting extremist slogans, the rioters ran to the top floor of the station and came under fire from the police, who were trying to stop them, said a policeman who declined to give his name. When the attack took place, most of the officers at the station were soliciting opinions from local residents about various public security works. By the time Metniyaz returned later in the day with a team of officers, the rioters had occupied the station. "I shouted in the Uygur language, asking the rioters to stop doing things that are against the law and to settle this dispute in a peaceful way," Metniyaz said. "But they kept throwing gasoline bottles and rocks at us. "I saw the rioters hacking innocent people. Some of them were wounded on their faces, noses and ears." Before the attack, the rioters had raided an adjacent building belonging to the local commercial authority. The rioters were all men aged between 20 to 40. They spoke with accents revealing that they hailed from somewhere besides Hotan. They also wore sneakers - "probably to prepare for running away," Metniyaz speculated. "The attackers didn't target a specific ethnic group," Hou said. "Both Uygurs and Han are among the dead and injured." "The slogans the rioters shouted showed they were religious extremists." Some Western media have linked the attack to "government repression" and claimed that it was prompted by the police's firing on "peaceful protesters". Hou said no peaceful protest took place on Monday. By Wednesday, business at the police station had not returned to normal, and an investigation into the riot was still under way, Hou said. The Naarburg Street police station is located in the Itkar Grand Bazaar in the city's downtown, where hawkers sell fruit, livestock and other goods. The bazaar is also a popular place for meetings. Hotan sits in the southern part of the autonomous region. About 96.3 percent of Hotan's population is composed of Uygurs and 3.5 percent of Han. The attack on Monday took place just days after the second anniversary of the July 5 riots in Urumqi, capital of the Xinjiang Uygur autonomous region, in which 197 people were killed and 1,700 injured.